This is an attraction located in the busy tourist area of Lake George, New York. Every Spring and Summer season thousands upon thousands of tourist ascend on the Lake George region to experience a premiere vacation. Amusement Parks, haunted Houses, Arcades, Fudge and gift shops many restaurants and museums draw large crowds. 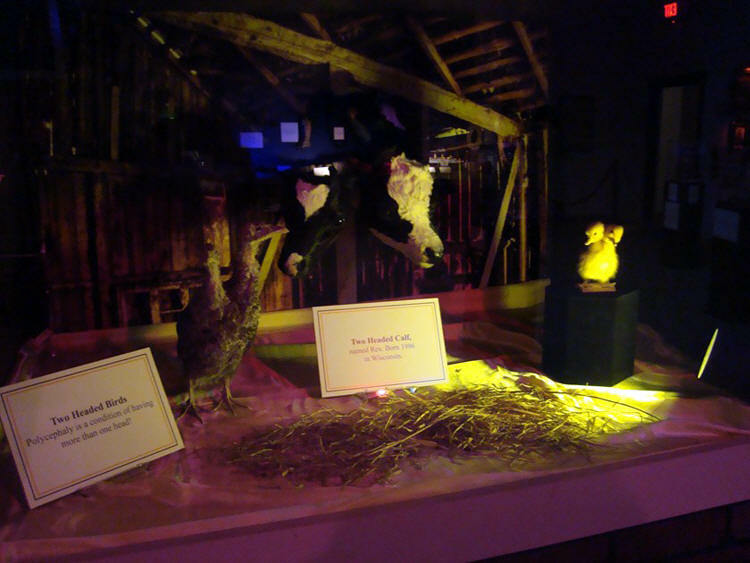 The museum is located on the second floor on the main street where all the foot-traffic takes place. The second floor is a total of 5,000 SF. with the museum and gift area occupying approximately 4,000 SF with the rest of the area for expansion, and office. This auction is for the contents of the museum, artifacts, inventory from gift shop and does NOT include any real estate. Real estate is based on a lease for the space, and if someone was inclined they could speak with me personally to set up a meeting with the building owner if one wanted to continue the museum, otherwise we reserve the option to utilize the space for our future needs. 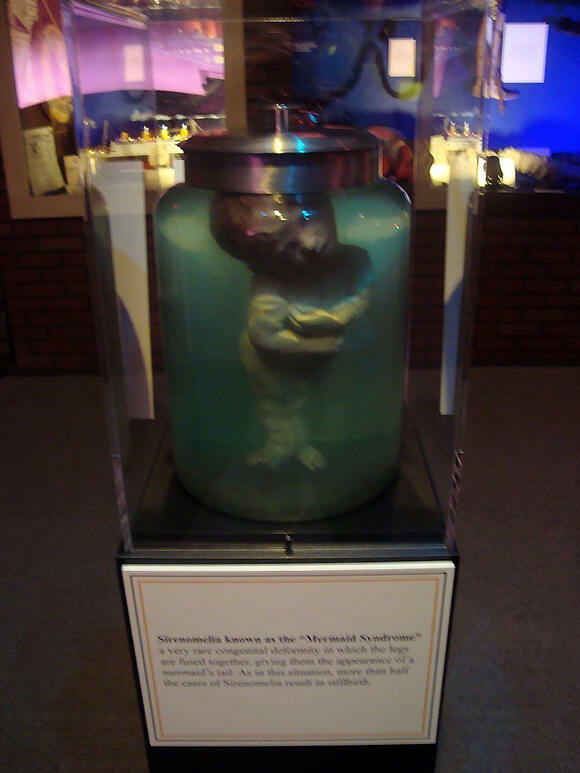 The museum comprises of many unusual items representing moments in history, oddities and things that attract the general public. 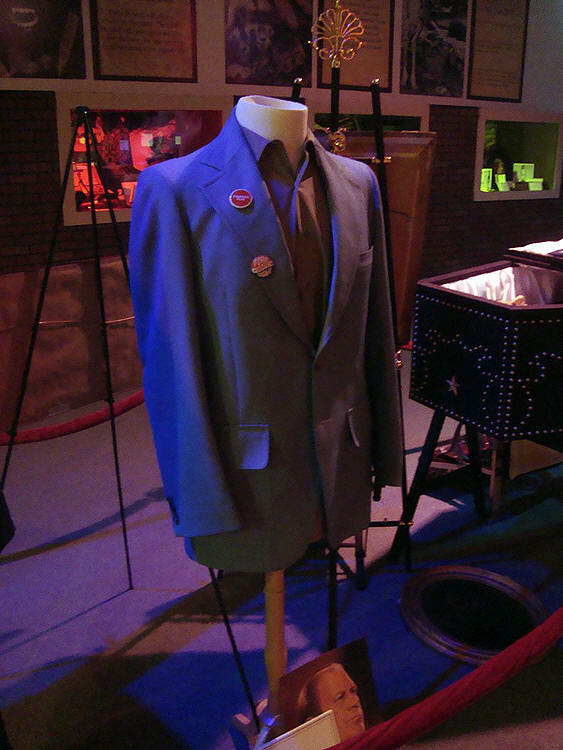 The museum comprises of many of thousands of dollars in professional signs, displays, stanchions and fixtures. You can have an instant collection or museum of your own! 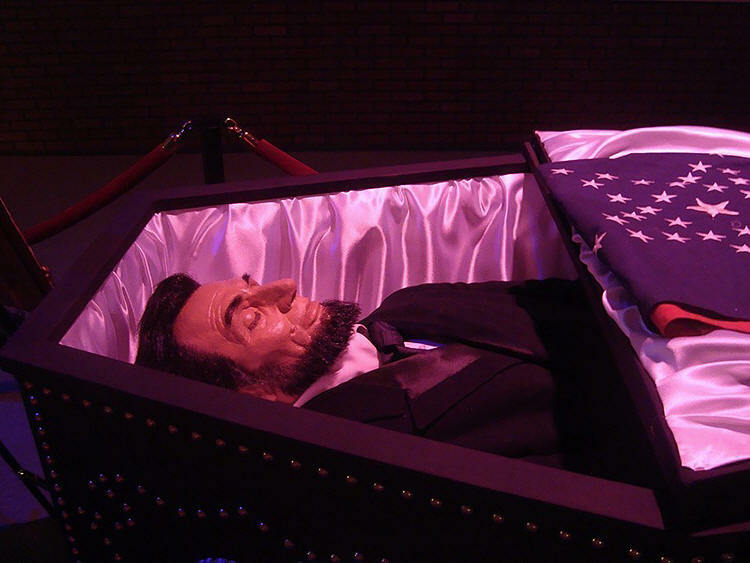 Wax like figure of Abraham Lincoln "Laying in State" in a near exact replica of the original casket Lincoln was buried in. 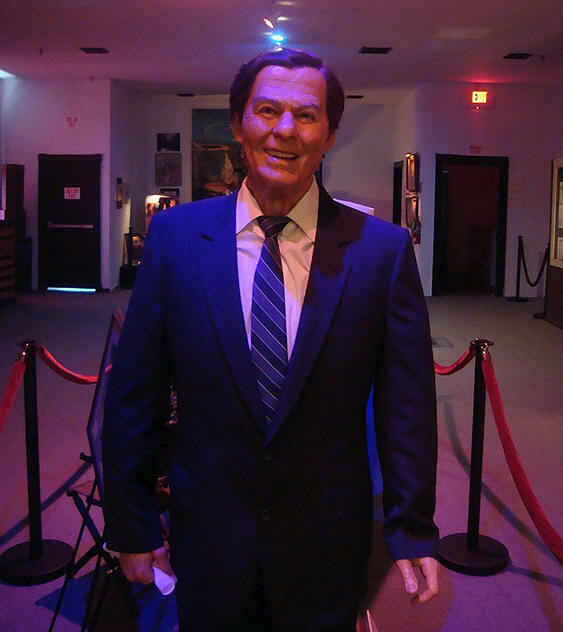 Wax figure of President Ronald Regan, one of the best likenesses we have seen of President Regan. 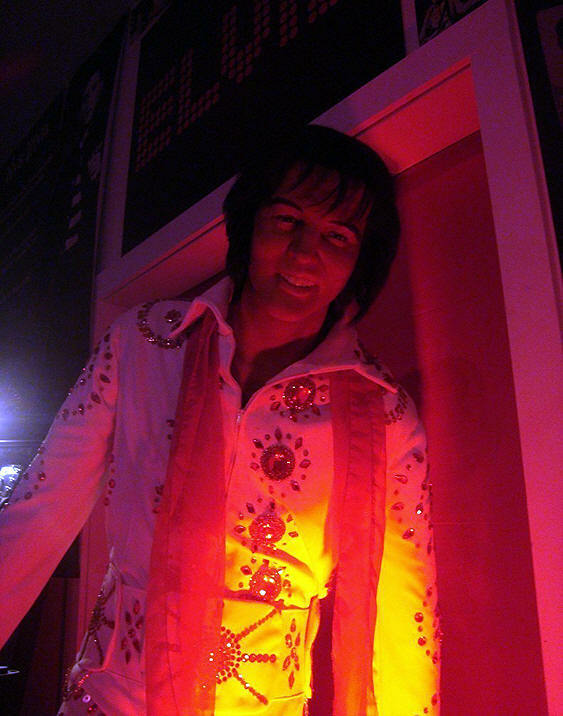 A rare and desirable wax figure of Elvis Presley in his prime, with replica jumpsuit. 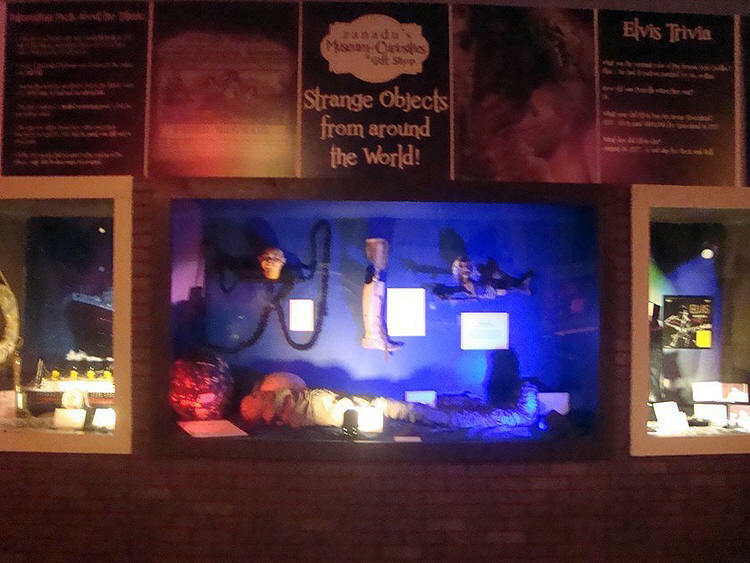 Large display with ball of ties, a very good replica of a ancient mummy, a mermaid, wax head of a dwarf with very long hair, a real wooden leg that was said to have been used to beat someone to death. An unidentified creature. These items are very realistic gaffs are in a lighted display. 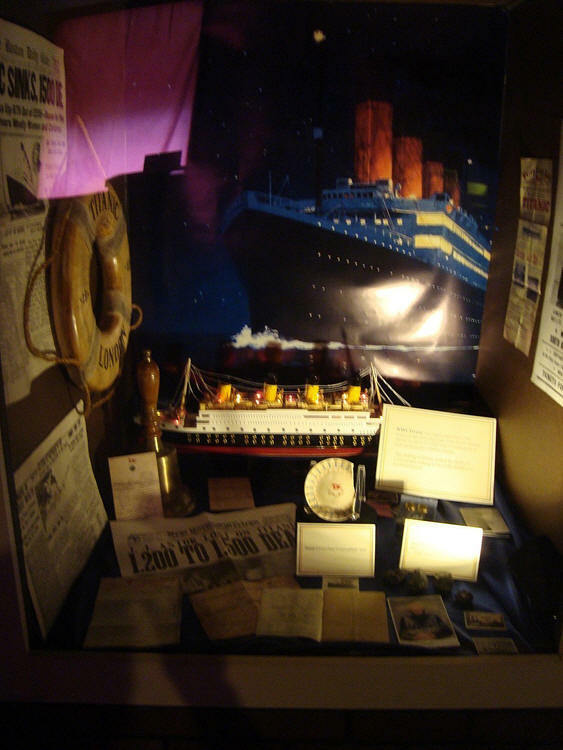 Titanic display with a replica lighted ship, many replica paper items, a broken piece of china said to have been recovered from the ship along with pieces of coal from the Titanic boilers, everything in this display is thought to be a replica , but nicely displayed. A very well-made pickled punk in a large oversized jar, looks very realistic. . Displayed on a pedestal with acrylic cover. Chinese foot binding display. With documents and wax like foot and a shoe. Displayed on a pedestal with acrylic cover. Skeletal remains of conjoined twins. Displayed on a pedestal with acrylic cover. Shoe of a giant. Said to be size 25.5" men's shoe from the 1940's. 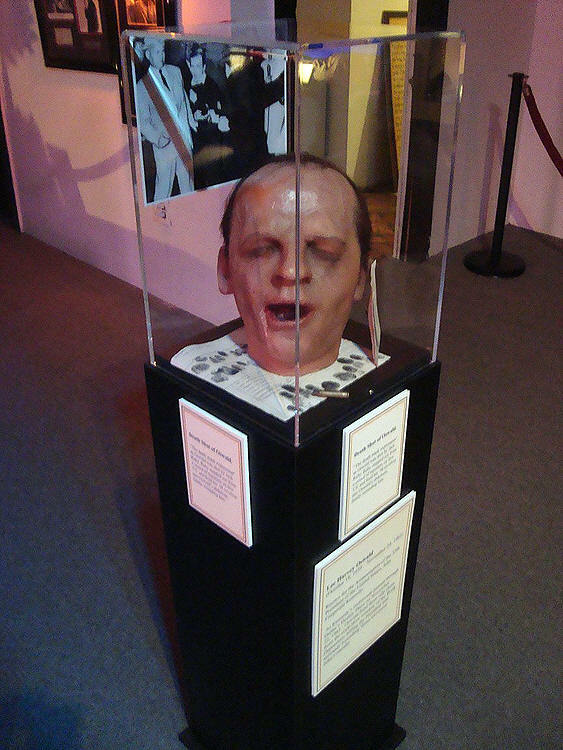 Displayed on a pedestal with glass cover. Civil war display window. 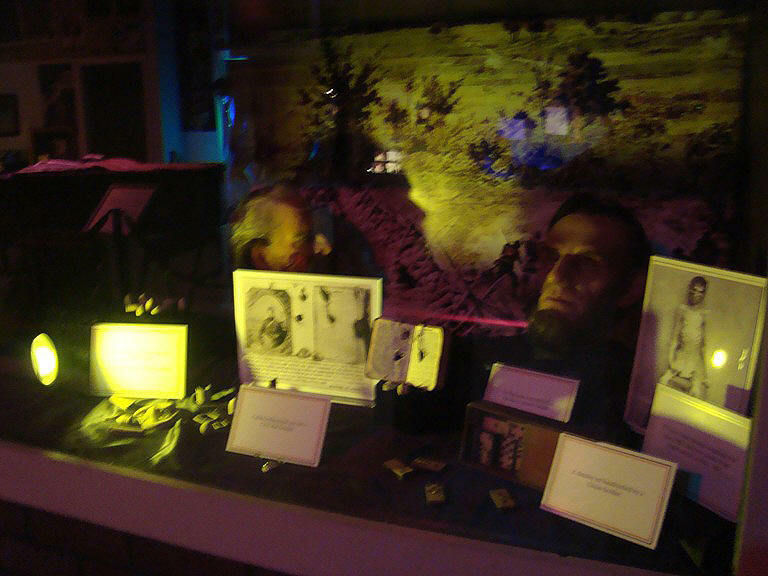 Another wax head of Lincoln along with a wax head of a wounded Civil war soldier. A replica bible with bullet hole that saved a soldier's life. Real civil war bullets and fragments and a real set of dominos hand-crafted by a union soldier, a real civil war era glass eye. 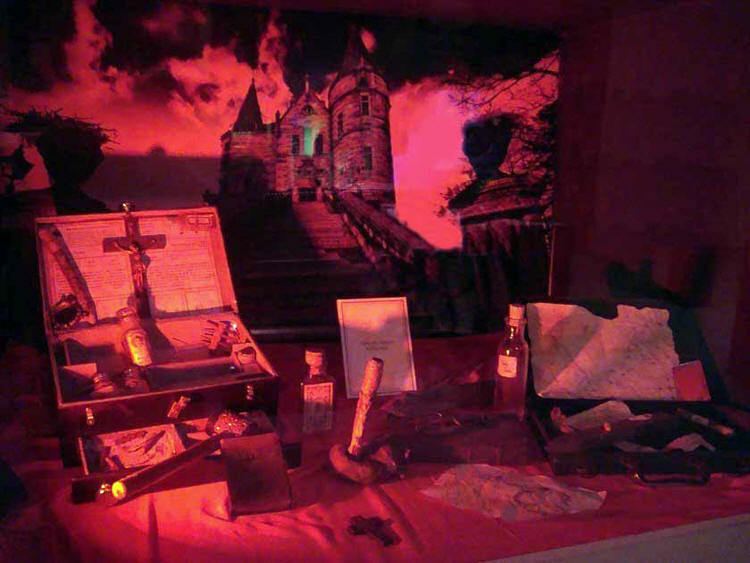 Display with two vampire killing kits, in a lighted display window. 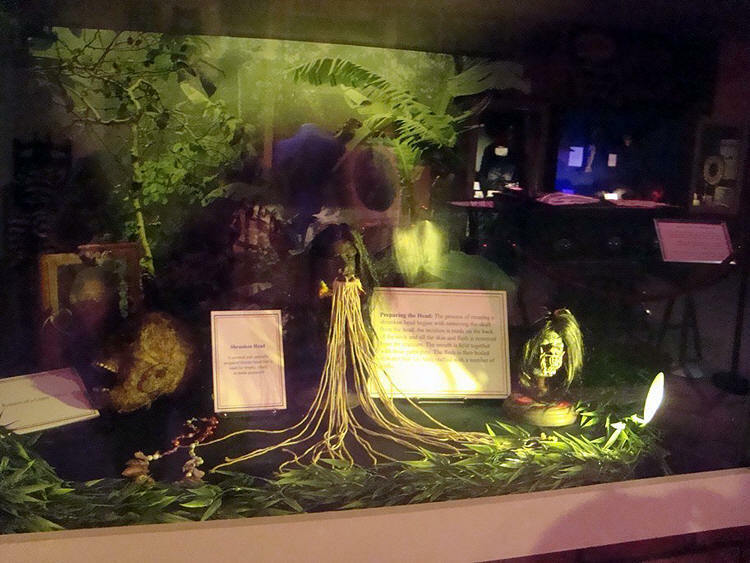 Lighted display window with shrunken heads and remains of a gypsy witch. An alien in a casket. 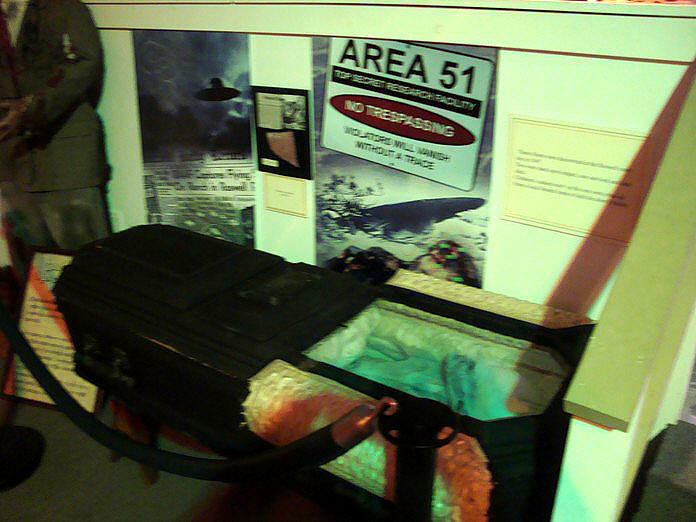 A real child's casket from the 1800's with glass window, has a realistic replica alien inside, along with a fragment of Roswell crash. Wizard of Oz display. A brick that has been painted yellow and signed by a number of the munchkins , these are authentic signatures. Replica Red Ruby Slippers. Authentic necklace that was owned by Judy Garland. 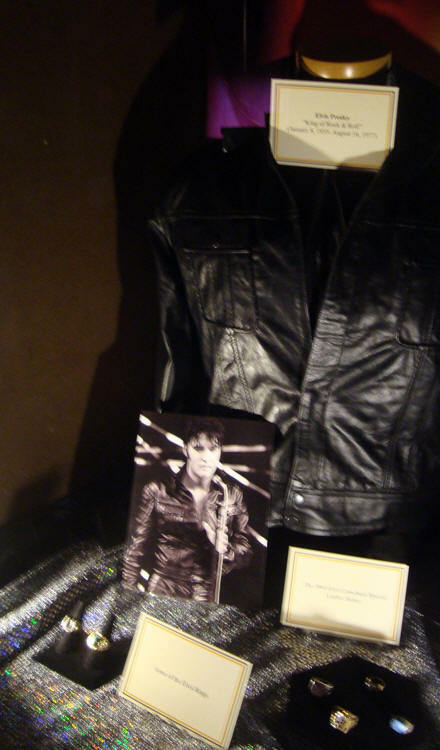 Elvis Presley replica black-leather comeback jacket. Replica Elvis rings. 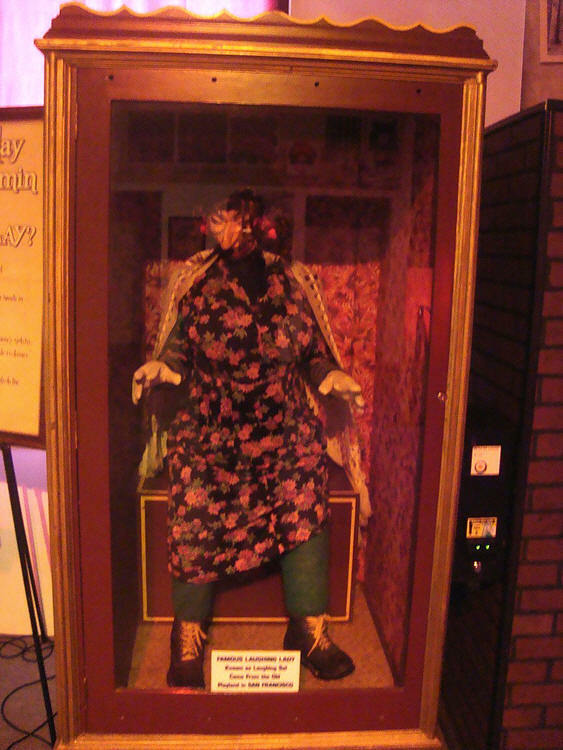 Laughing Sal from San Francisco in a glass case, set on $1.00 play to make her laugh. Ozzy Osbourne of Black Sabbath signed guitar, in large frame authentic. 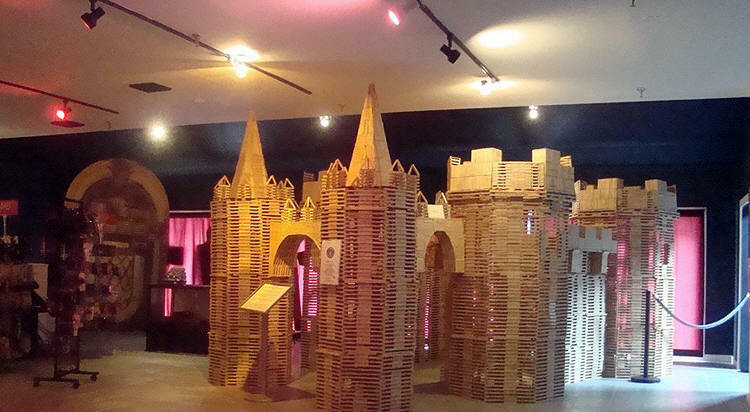 World's largest structure made out of Popsicle sticks! This castle is in the Guinness Book of World Records. 396,000 sticks in total, the piece is massive an very impressive. Still holds the record as the world's largest. Everyone takes a picture with this record breaking item. 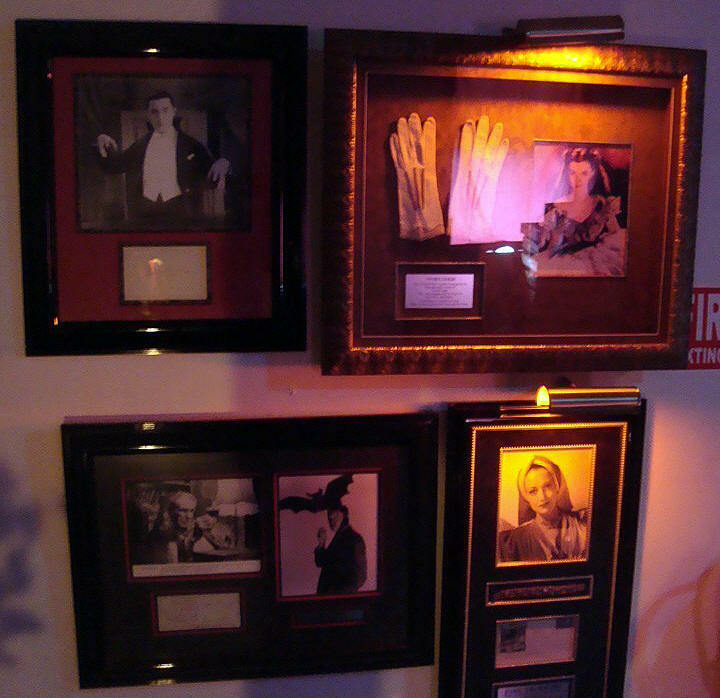 Gift area contains shirts, some joke and gag items, novelties, magic items, and display cases. Business includes cash register . Thousands of dollars in professional signage, stanchions. There are a lot of items with the castle being the largest structure. The successful party will be responsible for all the dismantling of the props and displays. The castle is in many sections and will take a large truck to haul it out. The laughing Sal is also large and very heavy. All items are located on the second floor. At completion of the auction the successful bidder with have 21 days to remove all the listed items. It should take a crew of several people no more than two days with the proper equipment. Payment will be due immediately following the auction with a cashier's check. All sales are final , as is where is, inspection of items is encouraged. This is a very unique, once in a lifetime opportunity to own an "instant" museum of artifacts and professional display pieces. This is the work of a number of years to acquire a truly unique mix of pieces with a great deal of resources involved. The name of the museum and company is not included in any way with the bidding of these items. This auction is for the items listed and does NOT include any other pieces that are NOT mentioned in this listing. Please read list and view photographs. We welcome your questions. Personal inspection can be arranged and would be encouraged. Lake George is approximately 60 minutes from Albany, the State Capitol of New York. Please Contact with Questions. More photos can be furnished upon request.